Congratulations, Wanda! You've won a prize package from Ranger! Please email me at ksdm@comcast.net to claim your prize. 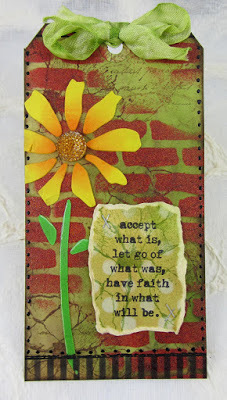 Be sure to check out Wanda's beautiful tag on her blog. Thank you so much to everyone who participated in this month's challenge! Spread the word about Wendy's challenge blog..we'd love to see more people participating in the challenges! We're so happy to see everyone's work each month. Stay tuned for next month's challenge, which will be announced on Thursday, October 1! Congrats to Wanda! What a great design with the brick wall bright bloom! Congratulations, Wanda. Looking forward to the October challenge.